Even though I’m convinced that Mary Kate and Ashley Olsen take most of their design cues from military surplus stores, Elizabeth and James, their contemporary line, hit some great style points with their fall 2012 ready to wear line. My teenager teases me mercilessly for wearing mostly earth tones: Check. There’s lots of take it or leave it layering: Check. Flat loafers and booties reigned: Check. Let’s break down this look into some acquirable pieces, shall we? 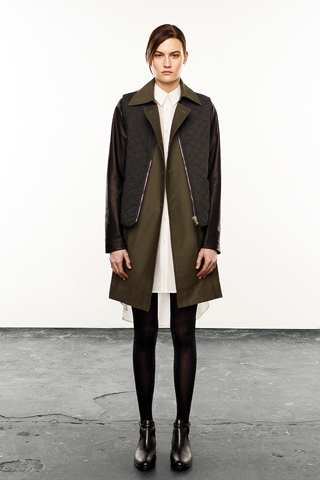 Olive trench – Because in the real world, coats should be able to close. London Fog trench coat.